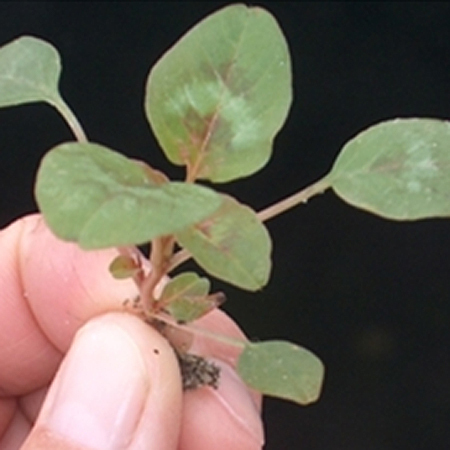 (May 19, 2017) – Farmers facing glyphosate- and ALS-resistant Palmer amaranth in their fields will need to take an integrated approach to managing the weeds this season and preventing further spread, says Ben Beale, University of Maryland Extension ag agent. Beale, who works in Southern Maryland, says he saw fields that had extensive infestations of the herbicide-resistant weeds last year in both St. Mary’s and Charles counties. Herbicide-resistant Palmer amaranth also has been confirmed on the Eastern Shore of Maryland and in Delaware. Beale evaluated 15 different regimens for controlling resistant Palmer amaranth in the summer of 2016 with funding from the Maryland Soybean Board. The board invests soybean checkoff funding to support research, marketing and educational projects. He found that “any residual herbicide is better than no residual herbicide.” Residual products that worked well included products with Flumioxazin (Valor) including premixes of Fierce or Fierce XLT, and products with sulfentrazone (Authority) including premixes such as Broadaxe, Authority Elite, and Authority MTZ.